We know everybody’s losing their minds over Nike Air Max 1s right now but the Air Max 90 is still the shoe that solidified Air Max in this country. The key to its shoe is its legitimacy — no other running shoe seemed to get the features this one did. Remember Silver Bullet and his boys at the Lloyds Building through Normski’s lens or that seminal 1991 feature about Chipie in ‘The Face’? Actually, if you’re under the age of 30, you probably don’t, but the 90 played its part there. Overseas, what other shoe could be worn by both George Bush, 2Pac, John Goodman, Iggy Pop and MC Ren from NWA? But even if you’re not ancient, you know the black-on-black, barely laced ubiquity of this shoe in mid 2000s during the hoody and happy slap scare, or on the feet of kids in ‘Practise Hours’ or ‘Lord of the Mics’. It’s the gangster rap, rave and rudeboy classic that was originally plugged by Australian distance legend Steve MoneghettI and in its OG colours, there’s not a lot of shoes that can rival it. What other shoe could go the distance and stay relevant like this one has? Laser Blues are one of the more conventional colourways from 1990, but that doesn’t stop it being a beautiful palette for this shoe. 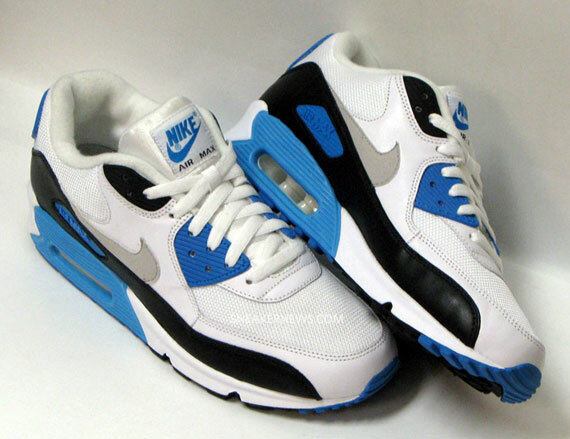 JD Sports caused a brief moment of import/export joy that brought retired resellers back into business in 2008 with their exclusive Laser Blue reissue (though didn’t that have a leather swoosh?) and the 2010 edition made some noise too. The NikeAir Max OG (and trust us, the Air Max hype this year has only just begun) madness has brought the Lasers back again. The sole’s yellow and for once we’re not mad at that, just like we weren’t mad at the yellow on the Infrared editions – we’d seen so many Infrared retros that the yellow felt like a nice point of difference (feel free to spit at us in the street for saying that), plus we’re glad that Nike didn’t try to simulate the earthquake-like cracks in the sole of original deadstock pairs after walking a metre, but that old look seems to have muted the shade of blue a fair bit. It’s hardly a light show in the laser stakes. Complaints aside, this is just one of those failsafe makeups that looks good on the foot. We hope we see some eggplant, lime and coral creations dropping at some point soon, because this model’s whole brace of 1990 and 1991 palettes can’t be beaten.